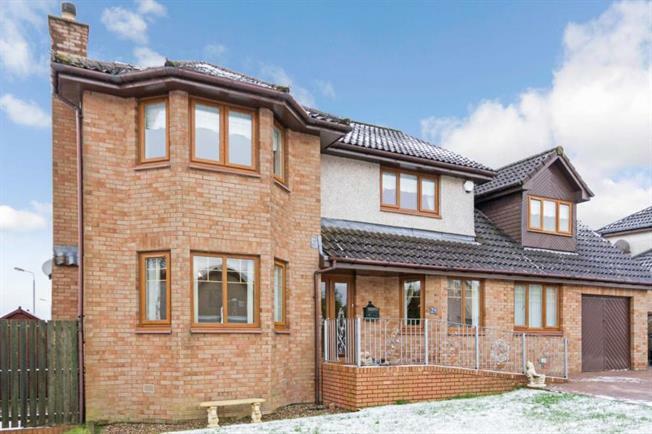 6 Bedroom Detached House For Sale in Airdrie for Offers Over £225,000. Located on a generous corner plot is this substantial individually built modern detached villa. The property offers viillage living yet only a short drive from the main town of Airdrie. The spacious accommodation on offer extends to entrance vestibule, reception hallway bay windowed lounge, separate dining room, modern kitchen, utility room, cloaks/wc and downstairs bedroom with wet room. On the first floor there are five good size bedrooms, the master having an en-suite showerroom and family bathroom. The property features gas central heating, double glazing and has a double driveway leading to an integral garage. There are large enclosed rear gardens with timber decking and a sun house. Caldercruix has local shops and a primary school with main shopping and high schools available in the nearby Airdrie. The property is on the doorstep of Caldercruix Train Station which provides direct access to both Glasgow and Edinburgh City Centres.